Alumni, friends, faculty and staff of the College of Agriculture and Life Sciences (CALS) gathered at the Park Alumni Center on Sept. 7 to celebrate the recipients of the annual CALS Alumni Awards. 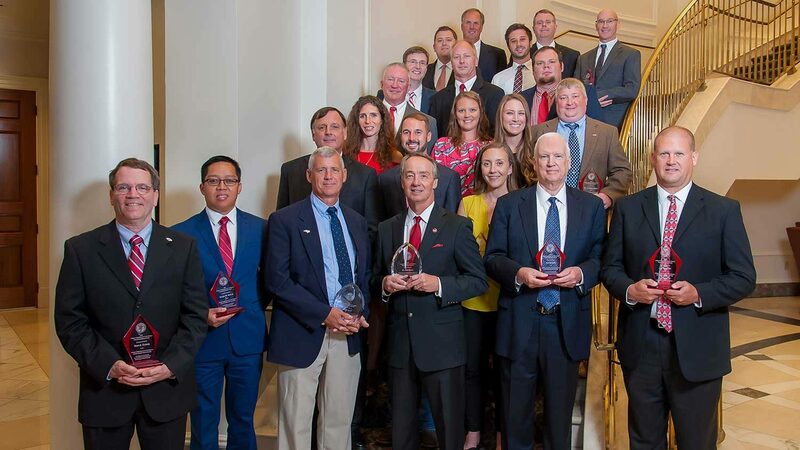 Alan Ayers and Tony Avent were honored as the 2018 Distinguished Alumni, joining a select group of prestigious recipients of years’ past. Also receiving awards at the event were 13 Outstanding Alumni and 12 Outstanding Young Alumni. These awards are given each year to recognize the stellar achievements of the college’s outstanding graduates and their ongoing commitment to giving back to NC State University. Alan Ayers, a native of Bear Grass, North Carolina, got his start in the agricultural industry picking tobacco and cotton as a boy. Since then, he has spent his career in crop protection advancing health and nutrition for people around the world. Ayers worked for Bayer CropScience and its predecessor companies for more than 30 years, and currently serves as the company’s director of state affairs and stewardship. His time with Bayer CropScience has included stints overseas leading global teams and responsibility over areas ranging from sustainability to legislative affairs. He has been honored with numerous awards during his career – including the CALS Outstanding Alumnus Award in 2009 – and has been a valuable resource for the college’s faculty in program development and in maintaining linkages with industry. Ayers earned a bachelor’s degree in zoology and a Ph.D. in plant pathology from NC State. Raleigh native Tony Avent was born with his hands in the soil. As a child, instead of playing games, he wandered the woods and fields near his home studying wildflowers. He parlayed that interest into a robust career – and lasting legacy. After earning a bachelor’s degree in horticulture science – where he studied under renowned horticulturist J. C. Raulston – Avent worked for the North Carolina State Fairgrounds as its landscape director for 16 years. He later established Plant Delights Nursery and Juniper Level Botanic Gardens, which he operates to this day with his wife Anita. With a passion for sharing his knowledge with others, Avent served as the News & Observer’s weekly garden columnist for more than a decade, and today is a contributing editor to Horticulture Magazine and Walter Magazine. In addition to running the nursery, Avent is a prolific plant breeder – best known for his Hosta breeding program.